As badminton becomes more and more popular worldwide, many children are starting to play with their parents at a very young age, with Grade 3-4 children playing for their school team and receiving formal badminton skills training. This is why choosing a pair of badminton shoes exclusively designed for children to protect their feet has become an important issue for parents. specialized badminton shoes when playing badminton? This is probably the first question parents ask. Most elementary school badminton training begins with speed of movement and six-point footwork, training that mainly involves the lower body and places the feet under a relatively heavy burden. Many elementary school team members begin playing competitively in Grade 4-5 so they need suitable shoes to give protection and reduce the chance of sports injury as they move quickly, stop suddenly and jump repeatedly in matches. Some parents might not understand badminton so don’t know what kind of foot protection is needed, or they believe mistakenly that child badminton is not as intense as the adult game so kids will be fine if they wear ordinary canvas shoes or running shoes. However, it should be remembered that the body of a child is still developing and the muscles in their feet are still not mature and strong, which means there is risk of injury if the feet receive a sudden impact; in addition, if the shoes don’t fully cover the feet, as a young player runs, stops and lunges repeatedly on court their toes will be squeezed inside the shoe, over the long term affecting the growth of the feet. Ordinary canvas shoes and running shoes are not designed for badminton so don’t provide the support and coverage needed. and the protection they provide is limited. 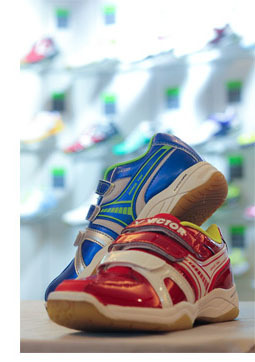 This means it is very important to choose a pair of suitable badminton shoes for children! In fact, children’s badminton shoes and adult badminton shoes don’t just differ in terms of size, they are also very different with regards to design and function;this means they are also inevitably different in terms of shoe structure and material. Firstly, the material used for the midsole of a children’s badminton shoe is softer than used in adult shoes, and this is intended to provide relatively good shock absorption when the feet hit the ground, protecting the still not fully developed feet bones of children. This also makes the shoes more comfortable when the player is moving around the court. If the sole is too hard, shock will not be absorbed effectively, over the long term causing the plantar fascia to be pulled, resulting in flatfoot, high arch or other problems. In addition, because more emphasis is put on the upper coverage of adult badminton shoes, there will often be design features to increase stability, which makes the shoes harder in texture. As children’s feet don’t just growth lengthways, they also grow sideways, the upper coverage design of children’s shoes has comfort as the main consideration and so will not use hard or inelastic materials where possible. Finally, we would like to remind everyone that choosing a pair of badminton shoes that are specially for children will not only protect a child’s developing feet, they will also allow your beloved child to run quickly around the court and enjoy playing without worrying about injury.